Tobu World Square exhibits miniature of 102 famous heritage and architectures of the world in the scale of 1/25. The exhibition includes 42 items of World Heritage registered by UNESCO. Also, you will find miniature of140, 000 people in the area, and will notice uniqueness of every individual if you look at them closely and carefully. Please enjoy detail works of those miniatures! >>Please enter at least 1 hour before the closure. The entrance (traditional sekisho, or checkpoint), Kabuki-mon is guarded by samurai (warrior) with swords and chonmage (shaved heads). You will need to buy a pass called tegata and receive a guide written in English including a detailed map of Nikko Edo Mura at the ticket office. 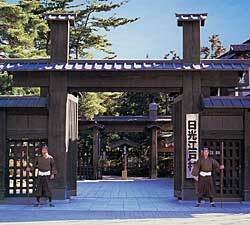 It is an authentic reproduction of the daily life of Japan’s Edo Period. Those will be streets, shops, clothing of people, shopkeepers and teashop waitress, ticket collectors, hairstyle, Ryo currency (pre Yen currency), buildings and so on. You will feel as if you live in Japan’s Edo era (1603-1867) once you step into the Nikko Edo Mura village. Those details make the atmosphere of the village more realistic, and are often used as sets for TV commercials, dramas and movies. Also, there are various entertainment such as shopping, food and live shows, in the area of.495, 000m2. These include traditional magic performances, comic and historical dramas, mock trial in a magistrate’s court, and Ninja aerial acrobatics (martial arts) staged along 400m wooden path. The contents of those performances and casts change every year. >> Please enter at least 1 hour before the closure. This bus will stop at both the Tobu World Square and the Nikko Edo Mura Village.